Comment: Minor, about 4 feet of, wooden trim dry rot around edge of roof. Dry rot of trim around top of garage door opening. Comment: Attach security bars on window on exterior. Screw 12 3 inch one way screws into wood pain for three windows. Comment: Plumber cut 2ft by 4 ft hole in exterior stucco to repair leaking pipe. I need a qualified stucco contractor to do wire, put in waterproof paper/barrier, then put in stucco. This hole is about 10 feet above the ground, between the first and 2nd floor. Comment: Need quote for small crack repairs on 1 maybe two sides of home. Comment: Replace worn siding, depending on price/budget up to about 1600 sqft. Renew insulation below siding as needed. Repair any termite frame damage if any exists. Need advice on siding material. Comment: Existing wood trim has experienced termite damage. Have two large "picture windows" and one piece of wall trim that need replacing. Repair needs: Leaking water or moisture, Stucco is cracked. Comment: Water stain on drywall at foot of exterior wall + damage of wood floor round the spot. Roofing issue ruled out. Cracks in stucco underneath window. San Jose Siding Contractors are rated 4.61 out of 5 based on 241 reviews of 15 pros. 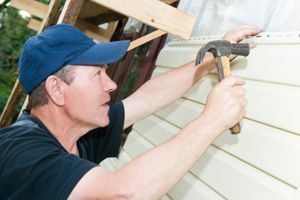 Not Looking for Siding Contractors in San Jose, CA?